There’s lots of fun to be had with the Atom Pintail Longboard! This deck follows in the tradition of the classic skateboards and goes back to a time when the first longboards were introduced. On and off such boards became popular or discontinued but the later designs and technologies for trucks and wheels and surfaces as well as the pleasure of riding a longboard has brought such products back to the market. Maple laminate deck construction that is both stiff and about 43 inches long, 9.6 inches wide with a weight of about 4.5 pounds. The truck materials are in Die-Cast Aluminum with hanger and base Cromoly axle of polished aluminum. Axle statistics also include 8.5 inches wide with a diameter of 8mm. It has a polycarbonate hub and accepts bearings size of 22mm, bearing of 8x22mm ABEC 5. Longboards like the Atom Pintail Longboard are for skaters who like to cruise their way down the street. They are not for doing major tricks and such but are more for that luxury ride like when parents buy those big luxury vehicles. They just hop in and drive and that’s the feel of the ride. 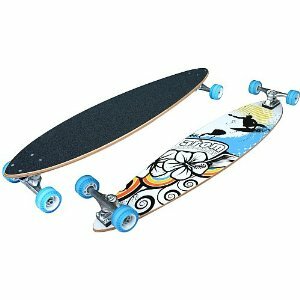 The same can be said for longboards like this one. The trucks are set far at the ends and the board is tapered without a kicktail. The weight of the rider is then evenly distributed across the surface of the board allowing for the shifting of one’s weight without disturbing the ride too much. In addition, a heavier load can be carried by the rider as the weight dispersal allows for better balance than on the decks laid out for tricks and fancy maneuvers. Speed is another issue. Don’t let the size of the Atom Pintail Longboard fool you. Like most longboards they may start out slow but if you’re not paying attention you’ll reach serious velocities in a matter of seconds. The smoothness of the ride can be deceptive and the next thing you know you’ll be hurtling past slow moving cars and scaring pedestrians. All in all, the Atom Pintail Longboard is a recreational longboard. Although it’s not designed for doing major tricks as mentioned before, it is capable of doing some stunts but one must take into account that the size of the deck calls for tricks and stunts that are geared for a skateboard this big. At almost two feet long you could probably skate down the street and serve breakfast on the top of this deck too. People will notice as you shred past them as they’ll not want to get run over. The cost of the board maxes out at around $80 but the board is guaranteed to last for a long time and many believe the price is more than worth it. The decals and grip tape come factory issued and are not of cheap construction. So you’ll be able to see this board last a long time as long as you keep up the maintenance and don’t do crazy stunts with it. Actually it should last decades if taken care of well. This entry was posted in Atom, Reviews, Skateboarding, Skateboards and tagged Atom, Longboard. Bookmark the permalink.